When I started out with this series on the 2012 San Francisco Giants I never imagined it to be this long. I set out to do it in one part. That turned in to 3, then 5, and now finally 6. I don't know all the reasons it turned out this long. But it did. I hope people have enjoyed reading and reliving last year as I have writing about it. It's tough to let go of something that means so much to you. There will never be another year like 2012. It's time for me to close the book and make it a memory. I know it probably takes a few minutes to sit and read any or all 6 parts. So once again, thanks for reading. I don't want to use some cheesy line like, "No one gave them a chance". But the reality heading in to the World Series was that most of the Sportswriters didn't. The Detroit Tigers had beaten the Yankees in quite convincing fashion in the ALCS. There is this thought out there that if they were that much better than the NEW YORK YANKEES, then what challenge could these boys from the bay give them? The Tigers had Justin Verlander, the Cy Young winner from 2011, and most dominant pitcher in the AL over the last 4 years. In the middle of the order was Miguel Cabrera, all he did in 2012 was hit for the first Triple Crown since Yaz in 1967. It didn't matter. None of that. The Tigers had talent, there is no doubt about that. The Giants played baseball like a team. They were a well oiled machine that could stack up against any kind of opponent. 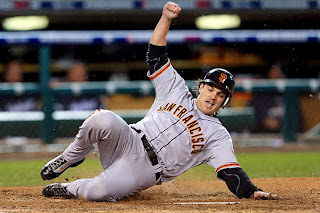 In the last 3 games of the NLCS the Giants outscored the Cards 20-1. The pitching staff could be dominant, and when it wasn't, Timmy was there to save the day. This Giants team was a throwback to the golden age of baseball, and I soaked it all up. My dad would have loved it. The Game 1 match up was the powerful Justin Verlander, and the soft tossing Barry Zito. The Giants faithful was elated at the chance to rally behind Zito at home. We all broke out our #RallyZito on social media, and invested again. The feeling at the ballpark, and here on my couch, was that the rest of baseball was about to see how good a team could be. It wasn't just a cast of characters, it was a well managed, well disciplined ball club. The game, and the series, couldn't have started any better. Barry Zito navigated his way through the top of the 1st and the heart of the Tigers order. In the bottom half it looked as if Verlander would be better than that. Pagan and Scutaro each grounded out to start. They weren't well hit balls either. Pablo cam to the plate. He had really gotten his stroke back since he went deep late in Game 4 of the NLCS. He also had seen Verlander recently. Back at the All Star game he almost took him out of the park while hitting a bases clearing triple. When the Panda is locked in, it is hard to stop him. Verlander got ahead quickly 0-2 on Pablo. He then threw a fastball just up out of the strike zone. Sandoval generated enough bat speed and got his hands high enough to catch up to the pitch. The ball shot out faster than it came in and made a long flight to deep CF. It kept going until finally settling into the crowd and sending people in to a frenzy. I lept off my couch and screamed. The great pitcher had proven to be human, and the Giants had a lead in Game 1 of the World Series in the 1st inning. The 4th inning was the kind of inning you dream of your team having. After Crawford lined out and Zito struck out, the top of the order went to work. Pagan doubled, then NLCS MVP Marco Scutaro drove him in with a single. Two quality at bats with 2 outs. 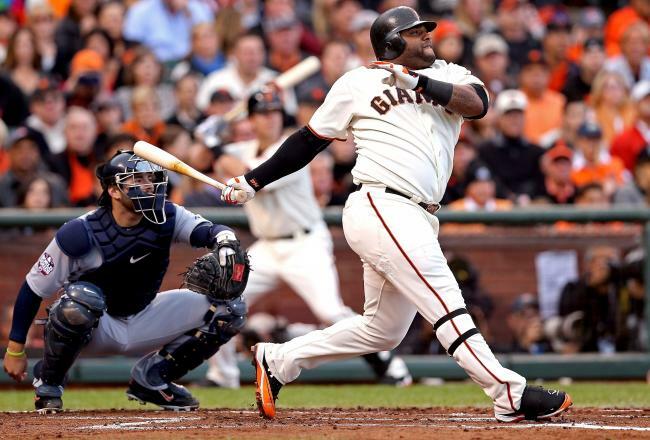 Pablo Sandoval stepped in for his 2nd AB of the night. Verlander bounced the first 2 in front of the plate, the third was a 95 mph fastball. Kung Fu Panda turned it around and sent it over the left field wall. Against the best the AL has to offer Sandoval was now, in total, 3 for 3 with 2 HR's and a bases clearing triple. Both HR's came with 2 outs. The Giants were ahead 4-0 and in control. History was made in the bottom of the 5th inning. 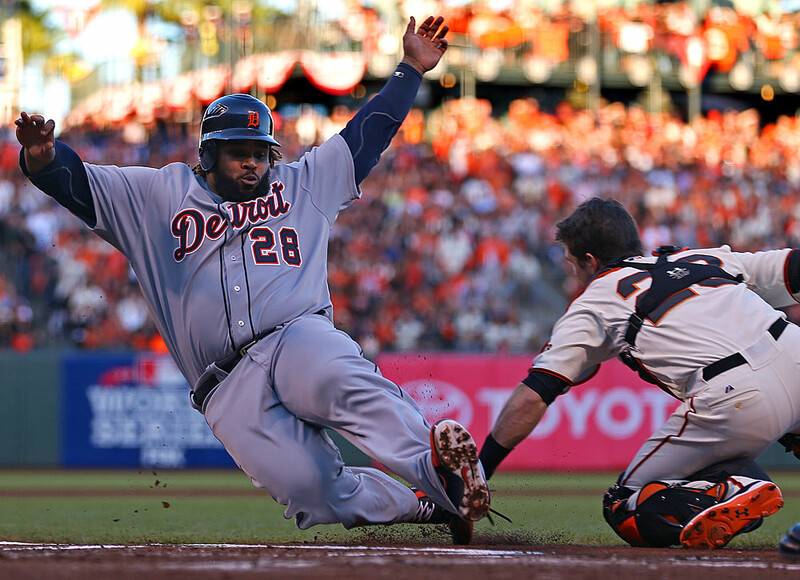 On a 1-1 pitch from Al Alburquerque, Pablo Sandoval hit his 3rd HR of the game. It was a solo shot to center field. 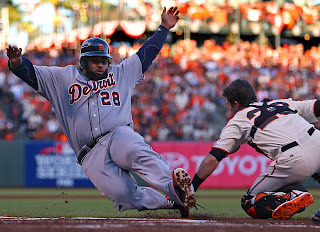 In his first 3 AB's of the 2012 World Series, Pablo Sandoval put his name in the books forever. He tied Babe Ruth (twice), Reggie Jackson. and Albert Pujols, as the only men in the history of baseball to do that in a World Series game. It's an amazing list. And now, forever, the lovable portly Panda is on it. With one run in and 2 runners on in the top of the 6th Zito had gone as far as he could. When Bochy came and got him he heard an ovation unlike any he had ever had. Barry Zito would now be forever loved. The swing man and secret ace of the staff was Timmy. He came in, got out of the jam, and shut the Tigers down for 2 more innings. Seven batters faced, 5 strikeouts, all retired. The swagger was back. The Giants built the lead and won Game 1, 8-3. Game 2 turned out to be the last home game of 2012. The Giants did not disappoint. In what was almost a nod to the 2010 team, they played a tense, nail biter of a game. Madison Bumgarner somehow found it again and was brilliant. He threw 7 innings and allowed only 2 hits and no runs. Doug Fister matched him through 6 as the Giants couldn't do anything against him. The lone chance for the Tigers early was in the 2nd inning. Fielder was hit by a pitch and Delmon Young came up. He hit the ball deep in to the left field corner and Fielder came chugging around trying to score. Gregor Blanco relayed it to Scutaro, who fired it to Buster at the plate. In a sweeping motion the ball was caught and applied to Fielder's foot for the out. It was a thing of beauty. The only runs scored in Game 2 were knocked in as outs were being made. In the bottom of the 7th the Giants loaded the bases. Pence singled to left, Belt walked, and Gregor Blanco laid down the most perfect bunt on the 3rd base line. Brandon Crawford came up with no one out an promptly hit in to a double play. The bonus of which scored a run. The Giants were ahead and Casilla had a 1-2-3 8th inning. In the bottom half Hunter Pence hit a sac fly to add another run while making an out. Sergio Romo came in and got the Tigers in order to end it. Game 3 in Detroit was the game for the Giants best defensive players. Blanco and Crawford were in the middle of everything. They both made stellar plays in the field. Blanco dove on more than one occasion and Craw chased everything down in his area. Ryan Vogelsong started and struggled. He didn't give up a run but was fighting his own stuff all game. After 5.2 innings Timmy was brought in again. 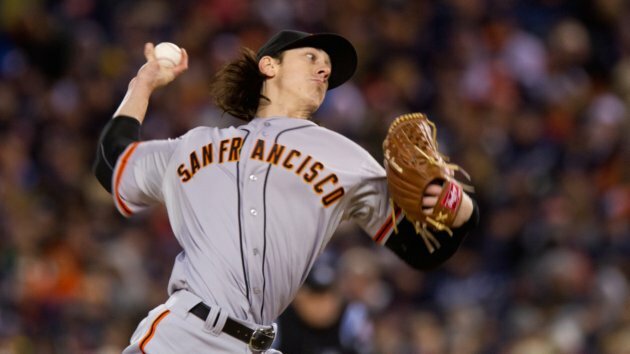 Timmy pitched another masterful 2.1 innings. He faced 9 batters without giving up a hit. So far in two games he hadn't allowed a single thing. The defensive stars took care of the scoring. In the top of the 2nd Blanco tripled to score Pence. Crawford singled to score Blanco. That was it. Vogey, Timmy, and Sergio shut down the Tigers the rest of the way. In 3 games the Giants had proven they could win in any number of ways, and the Tigers looked like a beaten team. Sitting down to watch Game 4 was like sitting down to a great final act. All the star players came out as well as the role players that made everything go. It was a fine ending to a great season. Matt Cain was out there on a cold Sunday night trying to clinch the World Seires. I put my dad's button down shirt on one more time. The pennant came out of my room and hung on the wall. My T-shirt and hat stayed the same. It was the chance to crown this team and have one more great day with dad. His hat sat right over my shoulder all playoffs long. The cold was not really the biggest factor. Both teams had played in cold before. It was the wind, that later turned to a light rain that was challenging. They played a thrilling baseball game anyway. In the 2nd the Giants jumped out early after a Pence ground rule double to deep left center field, and a Belt triple in the RF corner. It was in the bottom of the 3rd that the Tigers finally too their first lead of the World Series. Miguel Cabrera hit what looked to be a fly ball to right with 2 outs and 1 on. It just kept drifting, and drifting, until Pence had run out of room and the ball was in the people. The Triple Crown winner had finally made some noise. In the top of the 6th the MVP of the National League delivered. Buster Posey showed why he is the beating heart of this franchise. Scutaro led off with a single. He just never cooled down. Panda struck out and Posey stepped in. He turned on the second pitch he saw from Max Scherzer and put in the left field stands. The Giants led again, 3-2. Buster hadn't been having the best series, but leaders are there when you need them. 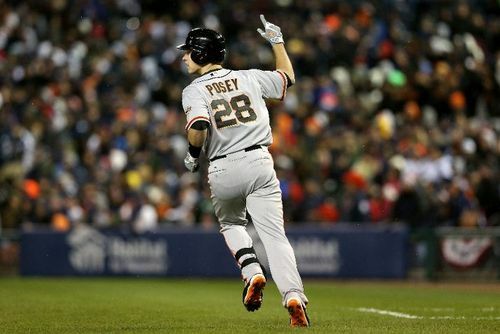 Buster Posey was the unquestioned captain of these Giants. Unfortunately Delmon Young hit a HR in the bottom of the 6th. The lead didn't last long. At home though the message was clear. These guys know how to get it done. Buster's blast may not have been the winning moment of the game, but it was the defining one. The bullpens continued to battle. The Giants had a couple of opportunities late but failed to cash in. After 9 innings it still wasn't over. The top of the 10th inning was a clinic in how to score a run. Ryan Theriot of all people was the DH in Game 4. He led off with a hit against Phil Coke. Crawford bunted him over to 2nd. The Giants had a man on second with one out. A base hit for the lead. Angel Pagan was up next. He went down swinging on 4 pitches. With 2 outs the man who had made the most contact in baseball over the second half was up. 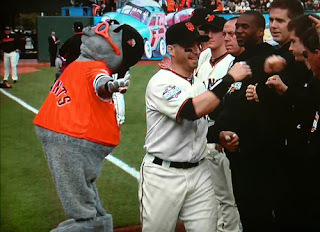 Marco Scutaro had been a hero many times for the Giants already. He played the game right and was rewarded for it. Here was his one last big moment. He came through. On a single that bounced just in front of Austin Jackson in CF, Theriot slid across the plate and released a yell of joy. The same scream being done in my living room at that moment. Sergio Romo came in and struck out all 3 Tigers he faced. Miguel Cabrera was left standing with a bat on his shoulder as the final strike flew by. The team, and I, erupted. 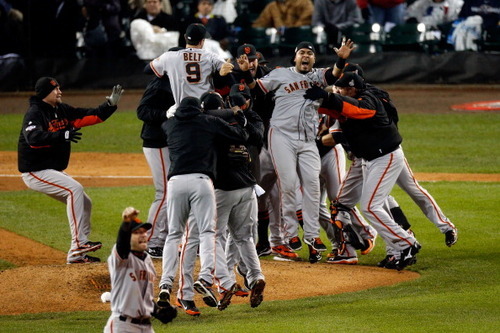 The San Francisco Giants were the 2012 World Series Champions. I felt so much happiness. In that moment I both missed and loved everything my dad had ever taught me. It wasn't just baseball, everything. Baseball has always been my favorite metaphor for life. I don't care how crazy it sounds, this Giants team was my dad's way of telling me everything will be all right. I'm not ashamed of that. It's why this team is favorite of all time. As a fan the 2012 Giants were the most memorable team of my lifetime. It'll be a hard one to top.